Thank you for all your positive feedback regarding the 100th issue of arc magazine. We’re happy that you liked it. 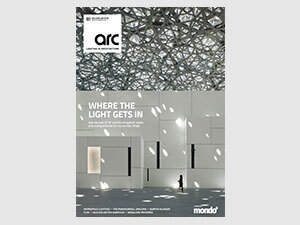 We’re delighted that the 101st issue of arc is the first lighting publication to cover the latest international mega-project, Louvre Abu Dhabi. Located on Saadiyat Island, Abu Dhabi’s planned cultural centre, the museum was inaugurated on November 8th. We worked fast to speak to the main protagonists – Jean Nouvel, 8’18” and BuroHappold – to bring you an insight into this amazing project. It is a lesson in how to design a project of this scale properly. All three design teams worked closely together from the very early stages with the lighting design process from 8’18” starting in 2007. A decade later and the results are incredible. Perhaps the most pleasing aspect from a lighting perspective is the way the artificial and natural lighting is integrated to produce a beautifully fluid piece of lighting design. A difficult achievement when so many precious and delicate artworks are being lit. Another important aspect of lighting design is the illumination of our workspaces. With 35% of your total waking hours being spent in your place of work, the lighting of this environment is crucial to your wellbeing and your productivity. Benz Roos, Senior Lighting Designer at Speirs + Major, offers an insight into the way he approaches illuminating a workspace arguing that we should be moving away from illuminating desks to creating interesting visual environments. That’s something we’ve tried to achieve in our own office with a new lighting scheme (p.122) that we’re very much enjoying. * With the new look magazine, it was time for a change to the Back Page. Our resident curators, Light Collective, have decided to create a new series: A Bucket List for Lighting Designers. You can help them create an amazing selection of things, places, experiences etc., that every lighting designer and lover of light should do before they die.